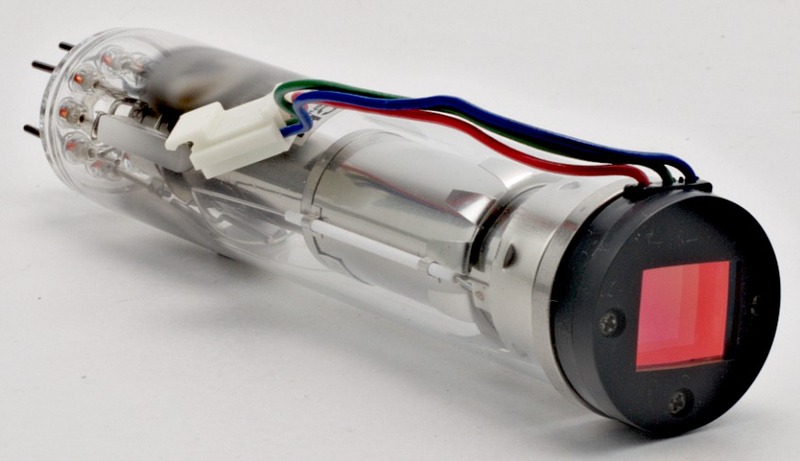 This saticon pickup tube utilizes a micro-striped filter layer on the target to electronically separate the three color signals, making it possible to use only one tube in a camera, instead of a tube for each color, as is standard for color cameras. Saticon is a registered trademark of Hitachi. The target surface is composed of Se, As, Te -- selenium, arsenic, tellurium - from which the name SATicon comes from. Diamètre • Diameter • Durchmesser : 2,6 cm • 1"